A third of nurses working alone in the community have been assaulted or harassed in the last two years, says the Royal College of Nursing (RCN). 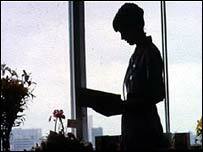 It surveyed 1,000 nurses who sometimes work alone and found 52% also felt the risk of abuse had risen in this time. The RCN is calling on the government to give more protection to these nurses. The NHS Security Management Service says NHS trusts must protect their own workers and receive guidance to do so which matches the RCN recommendations. About 85% of survey respondents spent more than a quarter of their time working alone, but almost three-quarters said they did not always receive all the information they needed about the risks associated with a visit. More than 6% had been physically assaulted in the last two years, but only 86% of such incidents were reported to managers - compared with 45% of verbal assaults. Two-thirds of the nurses said their employers did not always know their whereabouts when they were working, and almost a fifth had not received any conflict management training. The RCN says up to 100,000 health care professionals work on their own in the NHS every day, and it is calling on the government to honour its commitment to protect lone workers through funding training and technology. It suggests technical devices to monitor the whereabouts of nurses working alone should be used. For example, the Identicom system looks like an identity card holder but enables nurses to discretely raise the alarm if they fear attack. But the RCN says just 3.5% of NHS trusts have invested in such devices, and many trusts struggle to provide their nurses with a mobile phone. RCN general secretary Dr Peter Carter said: "Attacks on nurses, whether physical or verbal, are completely unacceptable and the results of this survey are extremely disappointing. "The change from care based in hospitals to the community will mean more and more nurses working alone, caring for patients in their homes and away from other staff. "We need to make sure that nurses working alone are properly protected, fully supported and feel secure." The NHS Security Management Service (NHS SMS) said the number of violent attacks fell last year by more than 1,000, and that 250,000 NHS staff had been trained in conflict resolution. Richard Hampton, head of the service, said: "Many of the RCN's recommendations reflect NHS SMS guidance issued to the NHS in March 2005. "Although we offer support and guidance on security issues, it is the responsibility of NHS trusts to ensure their lone workers are safe and secure. "Violence against NHS staff will not be tolerated. NHS staff deserve to work in an environment free from the fear of violence." He added that the use of technology, such as Identicom, must be used only as part of a wider policy including thorough risk assessment and training in conflict resolution. And Steve Barnett, director of NHS Employers, which represents healthcare managers, said: "NHS organisations take their responsibilities towards ensuring the safety of all staff, including nurses, extremely seriously. "Trusts will be looking closely at the RCN's survey."